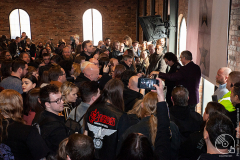 Several hundred die hard fans – including some who had travelled from as far afield as the USA, Israel and Sweden – packed out the city’s newly opened St Luke’s Church on Saturday morning to celebrate Black Sabbath’s legacy. The event – hosted by Brummie comedian, and Walk of Stars chairman Jasper Carrott – saw Sabbath guitarist Tony Iommi unveil a bespoke heavy metal bench, which is due to be placed on the renamed Black Sabbath Bridge on Broad Street once bridge restoration works are complete. 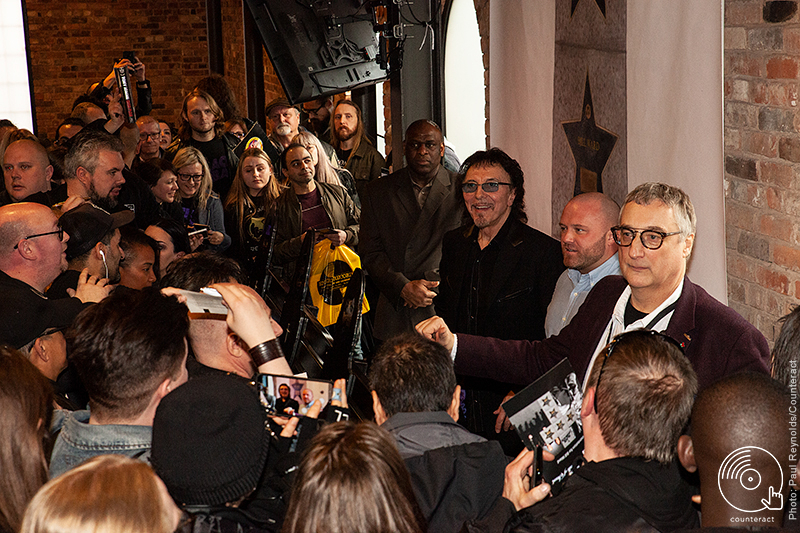 In somewhat of a triple celebration, Sabbath drummer Bill Ward was also awarded his own star on the Walk of Stars, following the induction of Ozzy Osbourne in 2007 and Tony Iommi in 2018 respectively. 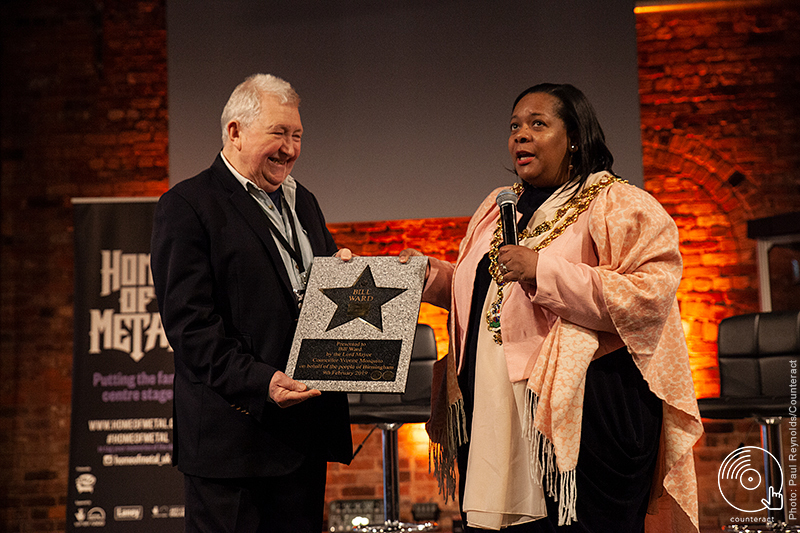 Bill couldn’t attend the event due to health reasons, so a recorded video message was shown and the band’s original manager Jim Simpson accepted the star, which was presented by the Lord Mayor of Birmingham, on his behalf. 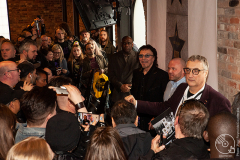 The band were also award a collective star which will be placed with the others in a cross shape in front of the bench once it has been installed in its permanent position. 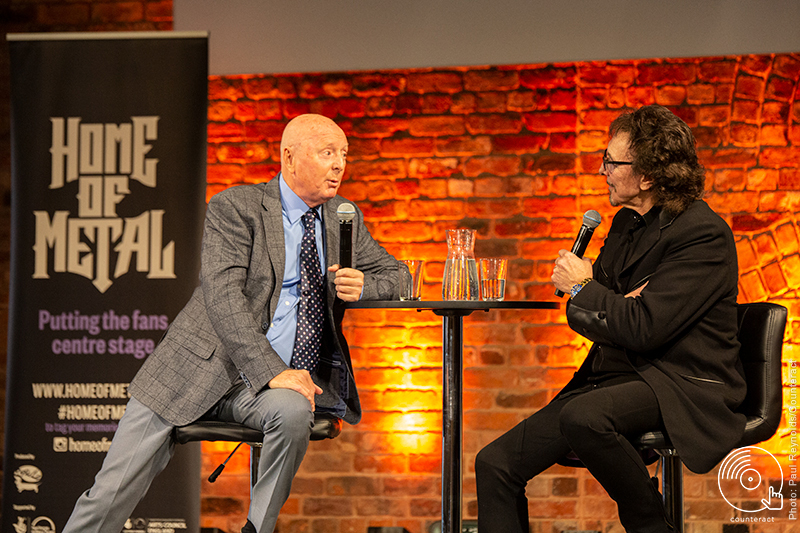 Jasper Carrott then sat down for a chat with Tony Iommi about all things Sabbath, with Tony telling tales of all things Sabbath, including the early days of the band and their last shows which took place in Birmingham in February 2017. 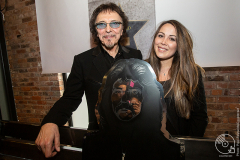 Chemistry between the pair was high as they quipped jokes back and forth to each other in the twenty minute interview. Tony also sent his well wishes to Ozzy Osbourne, who was due to play a headline show at the Genting Arena on the same night but had to postpone the tour due to a bad bout of flu. 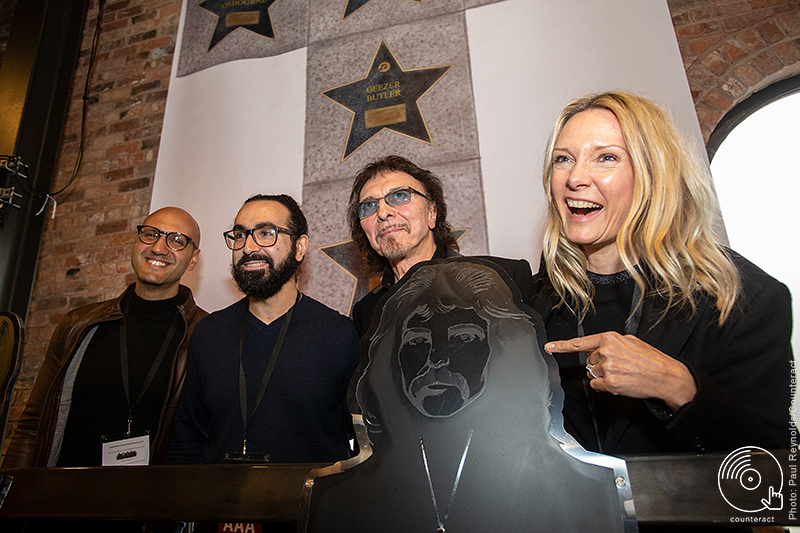 Tony then unveiled the heavy metal bench, alongside his wife Maria Sjšholm with both of them posing for photos alongside bench co-designer and Sabbath superfan Mohammed Osama and illustrator Tarek Abdelkawi, who designed the images of the four band members on the bench. 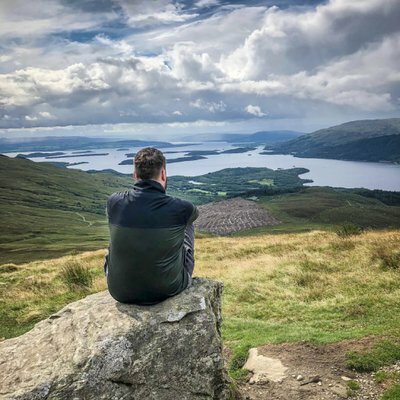 The bench, which was produced by Tyseley steelworkers Gateway Steel Fabrications, measures around 6m in length and is a wonderful result of brothers Ben and Phil Lungley’s tireless efforts. 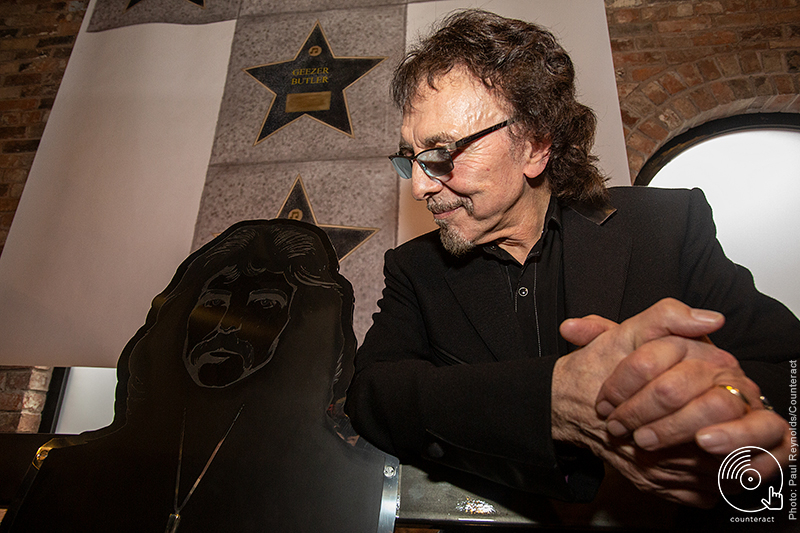 Fans then had the opportunity to take photos of Tony with the bench, while everyone in attendance was given a free pint of specially brewed Black Sabbath IPA from Solihull’s Silhill Brewery, alongside a commemorative glass to take home. 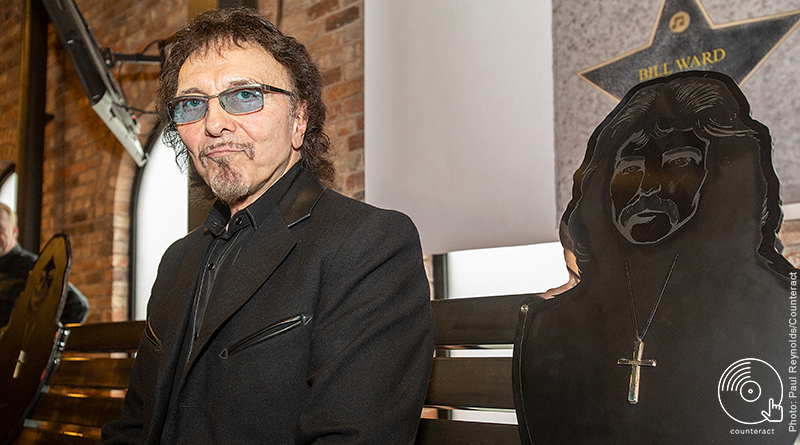 The heavy metal bench is now in storage until strengthening work on Black Sabbath Bridge on Broad Street is complete. See below for more photos from the event by Paul Reynolds/Counteract.